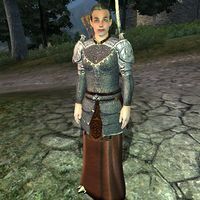 Schlera Sestius is an Imperial hunter residing in Pell's Gate. She spends all day wandering around Pell's Gate and never even pauses to eat or sleep. She wears a middle-class outfit consisting of a quilted doublet, light brown linens and a pair of doeskin shoes. However, she will almost always be seen wearing a leveled light armor cuirass and boots; both of which of the best possible quality for your level. She also has a fair chance (50% each) of possessing a pair of light armor gauntlets, greaves, and helmet; each of these also of the best possible quality. In combat, she relies on two bows, one of the best possible quality, and high-quality arrows. Both of these last items may possibly be enchanted. She also holds a decent amount of gold. Schlera Sestius carries many quality arrows, all of which are leveled. At high levels this can run to dozens of enchanted arrows, and they can be acquired by either pickpocketing her or killing her then looting her corpse. Schlera's AI packages are listed in the wrong order, meaning that she spends her whole time wandering around. She was supposed to eat from 8pm to 10pm and sleep in The Sleeping Mare between 10pm and 6am, since she possesses the AI packages for it. Even if the order was correct, however, the doors of the two bedrooms are locked and she doesn't possess a key so she would still be unable to sleep.